The separatist group, the Indigenous People of Biafra, has said it has asked its members not to participate in the forthcoming general elections because Nigeria has been “hijacked” by a single ethnic group, the Fulani. 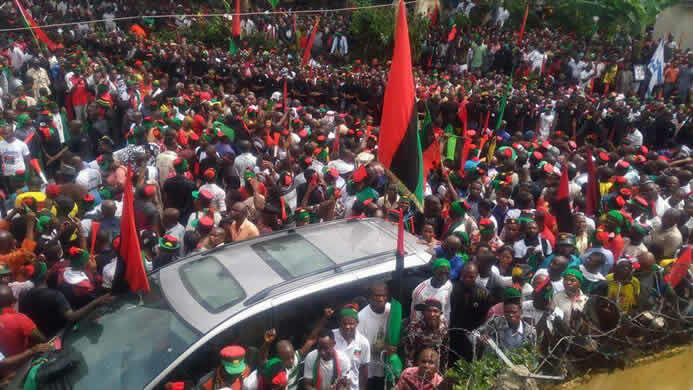 In a statement issued on Monday by the spokesman for the outlawed group, Emma Powerful, IPOB enjoined the supporters and lovers of Biafra to boycott the 2019 general elections, saying it was the only way for them to show the world that they were serious in their agitation to ensure the emergence of a sovereign Biafra. The statement reads, “It is important we notify our people, mostly politicians, clergymen and women who strongly believe in rebuilding one Nigeria to retrace their steps because the Nigerian government has been hijacked by Fulani people. “Our leader, Mazi Nnamdi Kanu, during his weekly radio Biafra broadcast from the holy land of Israel on Saturday evening reaffirmed strongly to the people and gullible Nigerians who still doubt our stand towards boycotting the forthcoming presidential election next month. It is crystal clear that one of our major lethal weapons to achieve this present Biafra demand is civil disobedience. Therefore, we urge Biafrans, both home and abroad, to advise their families not to vote and totally boycott this coming election no matter the level of promises and inducement politicians of these days might have given them.” The group accused the South-East governors, Okezie Ikpeazu, David Umahi and Willie Obiano, and the Igbo apex socio-cultural organisation, Ohanaeze Ndigbo of conspiring with the Federal Government to bring in Operation Python Dance to frighten the people to trigger panic, apprehension and fear. “It is in the light of recent distortion, twist and adulterated truth and propaganda against IPOB decision by unscrupulous individuals, groups and politicians in our land that prompted our supreme leader, Mazi Nnamdi Kanu, to come on air last week Saturday to state unequivocally without mincing words the position of IPOB in Abia and Ebonyi states gubernatorial elections, come next month.